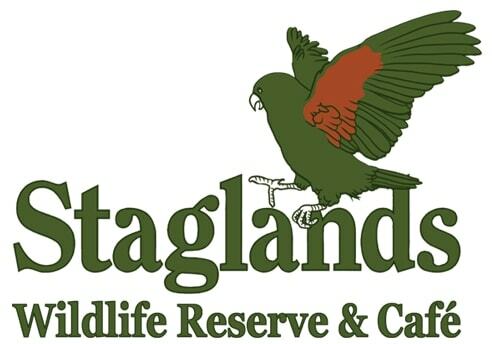 Staglands Wildlife Reserve & Cafe offers visitors the unique and exciting opportunity to connect with nature in a beautiful, natural environment. Feed and freely interact with wildlife in this very special place - the product of one man's passion and vision to experience nature at its best. Located in the scenic Akatarawa Valley near Upper Hutt, Wellington, Staglands is a 'must-see' attraction for local families and tourists visiting the Wellington region. A unique expression of New Zealand Staglands Wildlife Reserve features a variety of streams, ponds, hills and gullies, which have been created and developed over the past 40 years. Staglands Wildlife Reserve & Cafe offers the opportunity for people of all ages to discover the wonders of the natural world in a safe and fun environment. At Staglands visitors can feed and freely interact with wildlife in beautiful surroundings: enjoy the walk-through aviaries full of brilliantly coloured, twittering birds. Meet free-roaming kune kune piglets and delight in their company. Cuddle up to gorgeous guinea pigs and rabbits at The Stables. Watch the rainbow and brown trout fighting over their dinner in The Trout & Eel Pool. Get up close and personal with enchanting fallow deer in The Deer Park. Discover the magical world of The Secret Garden. Experience the nooks and crannies of The Old Bush Settlement - a nostalgic recreation of an abandoned settlement. Pack a picnic and your togs and make a day of it (there are complimentary BBQs and delicious swimming holes to enjoy) or savour the scrumptious snacks and sweet treats available at the log cafe.